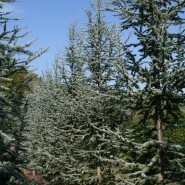 The Blue Atlas Cedar has blue, bluish-green or light green foliage. Height: 50′ to 75′. Spread: 35′ to 50′. Growth rate: Average. Form: Pyramidal. Exposure: Partial shade or partial sun to full sun.